Just a 15-minute walk from central Tepoztlan, Hotel Real del Valle features an outdoor pool, extensive gardens and views of El Tepozteco Pyramid. The hotel’s traditional Mexican restaurant offers a free continental breakfast. Overlooking the gardens or El Tepozteco, the charming suites at Hotel Real del Valle include free Wi-Fi, a fan and cable TV. The private bathrooms come with a shower and free toiletries. Guest can relax in the hotel’s spa, which includes a traditional Temazcal steam bath. Massages and other spa treatments can arranged on request. Hotel Real del Valle is situated a 15-minute drive from El Tepozteco Pyramid. The beautiful city of Cuernavaca is a 30-minute drive away. Free parking is available at the hotel. Hotel Spa Sitio Sagrado features activities like meditation, yoga and Tai-Chi. The property is located in the outskirts of Tepoztlán and offers an outdoor pool, plus a restaurant and a bar. The elegant suites are decorated in light colours and include a wardrobe, TV and a full bathroom with shower. All rooms feature free toiletries, while some units boast a hot tub and satellite channels. Tepoztlán is one of Mexico’s Magic Villages, and a popular touristic site is the region is the Tepozteco. Tourist will visit the place to hike a-top the hill and enjoy the colonial style of this town. A local market in the town’s centre offer art crafts and typical Mexican-snacks. The friendly staff at Hotel Spa Sitio Sagrado can help guests with arrangements to visit sites like Nativity Convent, Amatlán de Quetzalcoatl, Santiago Tepetlapa, among others. Cuernavaca city can be reached in a 30-minute drive. Make yourself at home in one of the 5 guestrooms. Complimentary wireless Internet access is available to keep you connected. Bathrooms have showers and complimentary toiletries. Conveniences include portable fans, and housekeeping is provided on a limited basis. Satisfy your appetite for lunch or dinner at the inn's restaurant, or stay in and take advantage of the room service (during limited hours). Meet other guests and eat at the complimentary reception. Quench your thirst with your favorite drink at the bar/lounge. A complimentary full breakfast is served daily from 8 AM to noon. With a stay at Casa Bugambilia in Tepoztlan, you'll be 2.4 mi (3.9 km) from El Tepozteco National Park and Pyramid and 17.1 mi (27.5 km) from Teopanzolco Archaeological Zone. This hotel is 18 mi (29 km) from Cuernavaca Cathedral and 18.7 mi (30.1 km) from Galerias Cuernavaca Mall. 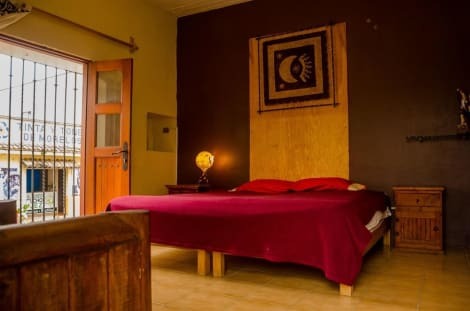 lastminute.com has a fantastic range of hotels in Tepoztlan, with everything from cheap hotels to luxurious five star accommodation available. We like to live up to our last minute name so remember you can book any one of our excellent Tepoztlan hotels up until midnight and stay the same night.